We’re off to see the wizard, the wonderful Wizard of Oz…well, you know the rest. It’s a lyric we all love to sing again and again—we often break into song in the office, and this is an all-time favorite of ours. We’re sure it’s one of yours too! We bet your toddler has seen The Wizard of Oz. It’s a classic loved by young and old alike. 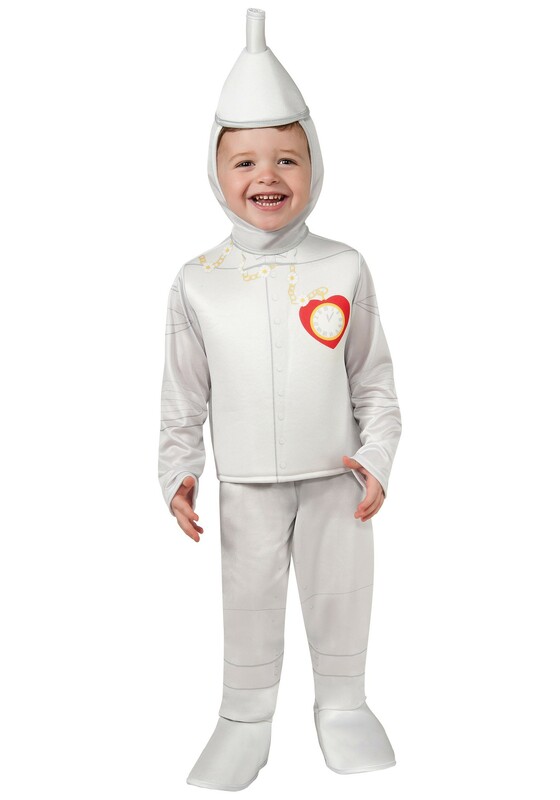 We’re sure your little one would love to be the Tin Man for Halloween. While he’s in costume, you can joke that he's not walking funny because he's a wobbly toddler. He just needs someone to oil his knees! Make sure to buy the oil can accessory, so you can run after him as he bumbles around. Now if you can only find a way to get him to sing, “if I only had a heart.” Soon, your little tin-guy will be on the path to see the wizard when he wears this Toddler Wizard of Oz Tin Man Costume. Why not have a Wizard of Oz theme party and dress up the whole crew? We bet your lovable little tike has a crew of unique friends. Could they be looking for a brain, courage…and home? Maybe they’ll all break into song and dance all the way down an imaginary yellow brick road. You’ll be convinced that we’re not in Kansas anymore, and that’s how the party gets started!